Legionella, Pseudomonas, Mycobacterium, E. Coli, Cryptosporidium, Naeglaria fowleri (“brain-eating amoeba”), Rotavirus: these represent a small sampling of the dangerous microorganisms that can be found within premise plumbing systems. The long pipe runs, warm temperatures, and stagnant areas common to large commercial and institutional facilities amplify the growth of these pathogens exponentially. Infections can spread via contact with water (whether touched, ingested, or inhaled). Fixtures like shower heads and equipment like cooling towers can aerosolize bacteria like Legionella pneumophilia, leading to severe, and sometimes deadly, pneumonia in immunodeficient individuals. Municipally-provided disinfection residuals are often inadequate for controlling these harmful agents to “safe” levels. 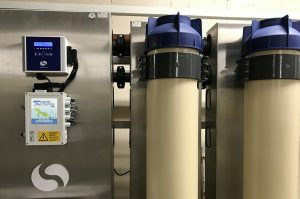 For this reason, Water Control is proud to provide packaged microbiological control tools, including disinfectant injection systems (Monochloramine, Free-Chlorine, and Chlorine Dioxide) and High-Capcity Ultrafiltration equipment for point-of-use, point-of-entry (whole building), and hot water recirculation systems. The High-Capacity Ultrafiltration systems, featuring German hollow fiber membrane technology by Seccua GmbH, remove 99.99% or more of bacteria, viruses, and protozoans – as well as other organic matter and particulates that serve as a food source for these microorganisms. Dissolved substances, like disinfectants, remain in the water and are made MUCH more effective by the lack of new organisms and nutrients. This allows the disinfectant residual, whether from the city or added on-site, to control any remaining microorganisms that may be present. Need help with a Legionella and pathogen control application?